Someone is taking the children of New Orleans. For the last eight months on the night of the full moon there has been an abduction. No bodies have been found. No ransom demands made. Poor or Rich. Black or White. Boy or Girl. The kidnapper does not play favorites. In this prequel to Spirits Among Us, nineteen year-old Jon-Luc Boudreaux is trying to manage his gift. He’s a psychic medium, in other words he sees the dead. They appear to him like living breathing people. At times it’s hard to know the difference. One night he is visited by the ghost of a young girl named Charlotte. Her message is simple; Save the children. Jon-Luc has no idea how to do that. He’s not a cop. He knows nothing about finding missing kids. He tries to ignore her, but Charlotte won’t leave him alone until he promises to help. Since her visits started, he’s had some very disturbing visions. When the signs begin to point toward Voodoo, he has no choice but to find an expert. Celestine Glapion is a Voodoo Priestess and a descendant of the great Marie Luveau. The minute Jon-Luc walks into her family’s shop she remembers him, but he has no memory of her. So when Mama Arelia tells her she must help with this crisis, she’s reluctant to work side-by-side with Jon-Luc. But she’ll do anything for the sake of those innocent lives. 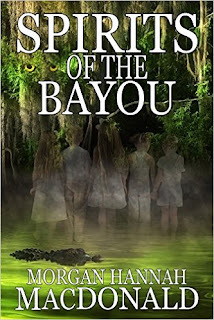 Their journey takes them to the underbelly of New Orleans where dark magic lives. Jon-Luc escapes death not once, but twice and still he pushes on. Knowing time is running out, the kidnapper speeds up the schedule. Now the children’s lives hang in the balance and only Jon-Luc holds the key to their survival. Can he rescue them in time? Jon-Luc Boudreaux opened his eyes to see a small child beckoning him from the doorway of his bedroom. She had a riot of blonde curls that cascaded past her shoulders, sorrowful brown eyes and dark shadows under her eyes. Her tattered grey dress was fashioned from another era. If he had to guess, he'd say it was circa the 1800's. It buttoned to her chin, the puffy sleeves were long and a dirty white apron topped it off. The uniform was three sizes too large. Her tiny feet were bare. "Come. You must save the children." Her tiny voice pleaded. Luc blinked a couple of times. "Who are you?" Her fists landed on her hips. "Charlotte Dubois." As if he should know, but he'd never seen her before. Had he? "I'm sorry, mon petit, but I have a big test tomorrow and I must get my sleep. Come back another time." He closed his eyes. The next thing he knew, he was no longer lying in front of the fan praying for winter. Instead he found himself in the thicket of a bayou. The humidity was so dense he could hardly breathe. A heavy fog drifted lazily along the water. Spanish moss dripped from the trees and swayed ever so slightly. Moonlight infiltrated the foliage above casting eerie shadows. A chorus of frogs and crickets serenaded him. From a distance the sound would have been peaceful, but standing amongst them the volume was deafening. Lightening bugs winked and blinked. The scent of decaying vegetation wafted through the air, not at all an unpleasant smell. 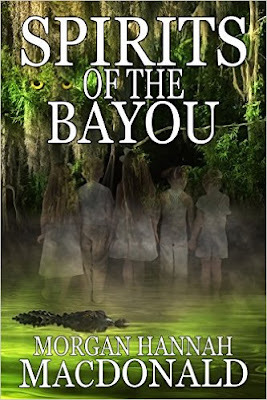 It reminded him of playing pirates with his friends in the bayou near his old house. A warm breeze kicked up and along with it came the odor of death. He glanced down to see that all he had on were the boxers he'd worn to bed. He wiggled his toes in the mud, and then tried to walk, but his feet were stuck. As if they’d been super-glued to that very spot. A splash nearby had him jerking his head toward the sound. He searched the area for gators. This was no place to find yourself after dark. Alligators and water moccasins were nocturnal creatures who fed at night. The venom of the snake was deadly and gators were strong and fast. Before you knew it, you could be grabbed, pulled into the water and drowned before devoured or stashed for eating later. A buzzing near his ear alerted Luc that a mosquito was preparing to feast. It landed on his arm and he slapped at it, but missed. The thing was the size of a blue heron and could probably have drained him of all his blood like a vampire. Okay, maybe that was a slight exaggeration, but it was the biggest damn mosquito he’d ever seen. He had to find a way out of there before he was eaten alive in one way or the other. The fact that Luc couldn't move really freaked him out. As ridiculous as it sounded, he found comfort in little Charlotte’s hand in his. As if this waif could somehow save him should something go terribly wrong. He squeezed her hand and silently willed her to stay by his side. His gaze ventured further out where he noticed children holding hands with their backs to him. Their feet hovered atop the mossy green water, the fog danced around their ankles. On the bizzaro scale from one to ten this dream ranked about twenty. "Why are we here, mon petit?" he asked. Her cherubic face turned up toward him. "You must save them, Jon-Luc." 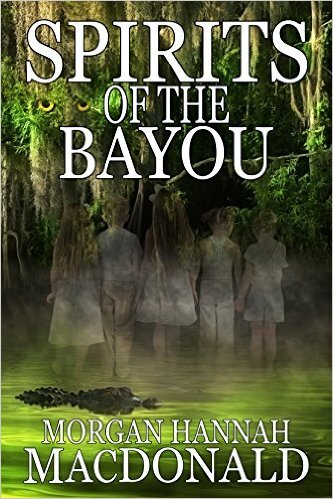 Her finger pointed to the kids in the middle of the bayou. "From the evil that keeps them here," she whispered. Love this series.. Thanks for the creepy excerpt! !